Do you play a contact sport? Then you need a sports mouthguard. Australians love sport. Playing sport gives lots of health benefits, but comes with a number of risks, one of which is to your teeth. Contact and/or minimally contact sports are particularly susceptible to dental injury. However, in any sport that involves balls and a fast pace there are risks. This doesn’t mean you should stop playing sports but it does mean you should minimise the risk by wearing a mouthguard. A mouthguard works to take the impact away from your teeth in the event of injury to the face. With no mouthguard, the upper front teeth can instantly fracture if they take a direct impact. An impact to the lower jaw or face transmits the blow and shock waves through the skull. Sometimes forcing the jaws together and causing a fracture of the upper teeth by punching them forwards. In extreme cases, the transmitted forces are so high that they can cause a fracture of the lower jaw, or a concussion. Custom made mouthguards act like a shock absorber by spreading the force over a larger area. Resulting in milder injuries than fracture and tooth loss. A custom made mouthguard offers you the best protection for your teeth. It spreads the impact of a damaging blow to the face and absorbs some of the shock. These mouthguards are specially made for an individual’s mouth. A plaster cast is taken of your mouth and is used as the model for the mouthguard. The mouthguard is made from two or more layers, follows the contours of your teeth and mouth. This allows for normal breathing and speech as well as overall comfort whilst wearing. We recommend a custom made and fitted laminated mouthguard. We believe their design is superior to many others with a wide range of colours and patterns available. Your name and contact number can be laminated in the clear layer, increasing the change of return. Over-the-counter mouthguards are available from chemists and sports shops. These mouthguards are either a readymade generic fit or boil and bite and cannot spread the impact forces over the mouth and teeth sufficiently. They are inexpensive, offer basic protection, but can be difficult to keep in mouth. These mouthgaurds also partially restrict breathing and speech. They are often of poor quality (which is reflected in the cheap price) and cannot protect the teeth and jaws properly. Because these mouthguards are not properly fitted to your teeth they can be a choking hazard in the event of an unconscious player. Because the risk of damage is high and the consequences can be significant and lifelong it is worth investing in a properly fitted mouthguard. Who says I should wear a sports mouthguard? Many sports associations require the use of a mouthguard before you are allowed to play. 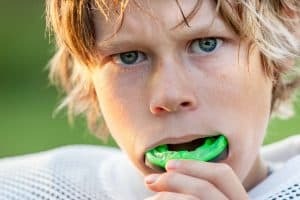 The Australian Dental Association (ADA) recommends the use of mouthguards across all contact sports as well as ball sports to ensure proper protection against damage. Sports Medicine Australia recommends the wearing of custom made mouthguards when playing any contact sport. In fact they take this so seriously that they have partnered with the ADA to develop a mouthguard policy for all contact sports. Boil and bite mouthguards can be bought off eBay for as little as $5. Most boil and bite mouthguards would typically range from $30 – $100. A custom-made fitted mouthguard is initially a little more costly and are $225, A well cared for mouthguard can last up to 10 years. Which is $22.50 per year – no different to a mid range boil and bite!! Many patients view the cost of a mouthguard similar to insurance – something you have to minimise the significant costs (including physical cost) of dental and hospital fees as a result of an injury. What can happen to my teeth if I don’t wear a sports mouthguard? If you are not wearing a mouthguard any impact to your face and mouth can lead to cracked, fractured or knocked out teeth, broken jaws, cut lips and tongue. To give you a real life story of the damage that can be done with an ill fitting mouthguard read the attached article. Rinse with water directly after using, cleaning with toothbrush /toothpaste and occasional rinsing in mouthwash will keep it clean and fresh. Always keep the mouthguard in the supplied breathable storage box. Avoid extremes of temperature, i.e. leaving in the sun in a hot car. Bring along to dental and hygiene checkups for review/professional cleaning.